You can do some great things in a Web browser, but some tasks are better left to software installed on your computer. This is true for e-mail, for instance. It’s also true for tax preparation. Intuit TurboTax and H&R Block TaxCut both come in desktop and online versions. 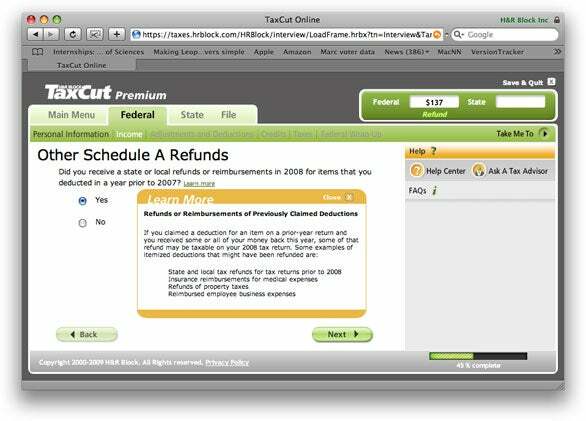 I compared the desktop versions of TurboTax and TaxCut elsewhere at Macworld.com. Here, I look at the online versions of TaxCut Premium and TurboTax Home and Business, both with the California state option. As with the desktop versions, TurboTax online is superior to TaxCut online, with better navigation and help. But neither measure up to their desktop counterparts. Looking for more reviews of online tax preparation programs? See PC World’s reviews of CompleteTax, TaxBrain, and TaxCut. The online versions offer some benefits. Because your data is stored online, it is protected from loss by a problem on your Mac. You can also use the online software to work on your taxes from any computer, Mac or PC, at any time. And, you can try both online offerings out for free and pay only when you print the tax forms or file electronically. But there are more compelling reasons to use the desktop versions. The desktop versions are faster, and they sport superior user interfaces that are easier to get around in. Storing the tax prep data file on your Mac means you can refer to it without being connected to the Internet. You can keep it to import into next year’s tax prep software. And, surprisingly, the desktop versions can actually be cheaper. The online TaxCut and TurboTax sites both offer a free version, one that works with the simplest tax returns without a state return. Once you add a state return, the cost of the online version rises. For instance, TaxCut Premium online is $40 without a state, $70 with a state return. The equivalent desktop version, TaxCut Premium Federal + State, is $50—$20 cheaper and a better product. TurboTax’s online versions don’t exceed the cost of desktop version. TurboTax Home and Business online is $75 for the federal return. Add in the state, and you’re up to $101, about the same as the desktop version. The first thing you’ll notice about the online versions is the lack of the menu bar and menu commands of desktop Mac software. This makes it more difficult to browse around for a particular command. TurboTax online also lacks some of the useful navigation features of the desktop version. The Web version doesn’t have the handy new bookmarking feature of the Mac software version, and lacks the toolbar and handy buttons that accomplish various tasks. The online versions also don’t present views of most of the actual federal tax forms while you’re answering the questions and entering your data—a long-time feature of the desktop versions. TurboTax lets you see only the 1040, and TaxCut doesn’t show any forms. This is not a feature that everyone needs, but if you are comfortable with the IRS forms, it can be very useful for checking your progress. 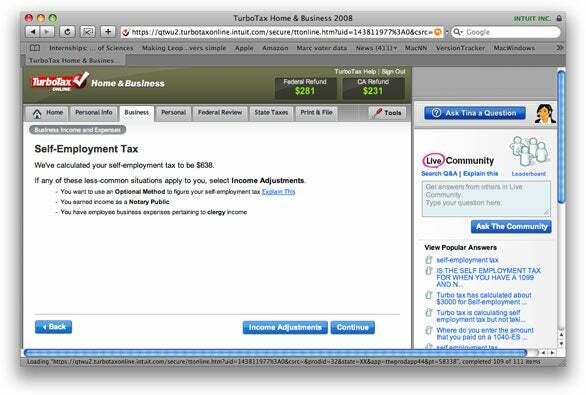 The online version of TurboTax is similar to the desktop version and includes the Live Community help. The online versions of TaxCut and TurboTax have similar abilities to import data as the desktop versions. If you used a desktop version last year, you can import the file, which adds your personal information ID numbers, and other data. You can also import data from Quicken. TurboTax goes the extra mile in letting you import your W-2 if your company uses a W-2 preparer that Intuit supports. TurboTax can also download and import information on mortgage and student loan interest. Jumping around the different areas of the tax software is something you’ll likely find yourself doing, as you make new discoveries or decide to make changes. This is much easier in TurboTax than in TaxCut. For one, TaxCut’s back button doesn’t take you to last page you were on, as you would expect. If you go to another section, the Back button takes you to a previous page in that section, not to where you were. TurboTax doesn’t have this problem. The online TurboTax has a layout and navigation that is similar to the desktop version, which is well thought-out. TaxCut online has inferior navigation to its desktop counterpart. The online version of TaxCut insists that you answer the questions in the order that it presents them to you. For instance, you can’t start entering deductions until you finish the personal information and income sections. The desktop version of TaxCut doesn’t have this limitation, and lets you jump around to where you need to be. TaxCut’s online interview process is sequential and won’t let you jump ahead. When you log on to TurboTax, the online service will bring you to the exact page you were on when you logged off or quit Safari. TaxCut gets you close but you’ll have to click through screens before you get back to where you were. Unless you’re a tax pro, the help system is something you will likely be using. TurboTax offers the same excellent Live Community help that is in its Desktop version. Live Community is not simply a database of topics, but an online compendium of questions provided by users, and answers provided by users and Intuit tax staff. Type in a question and relevant answers come up. I was able to quickly find answers to any question I threw at it. If there are no answers already stored, your question goes out to the users and Intuit staff, who can answer it. And, if you want to help out others, you can answer other users’ questions. By contrast, TaxCut’s help is useful when you can find an answer, but it might take multiple searches on different keywords before you find the answer you’re looking for. H&R Block TaxCut Premium does have one advantage when it comes to help: It comes with one session with a tax consultant, either by e-mail or phone. With both TaxCut and TurboTax, you have the option of purchasing a review of your completed return by a tax consultant. That consultant will tell you if it looks like you might be able to lower taxes or if there are errors that the software didn’t catch. To get this service with H&R Block, you need to buy the online version of TaxCut called TaxCut Signature ($80, $110 with state, or $30 more than the Premium version). TurboTax offers this service within the software itself. In any of the versions, there’s a Professional Tax Review link in the Federal Review tab, which lets you send your completed return to Intuit for $40. If you want to go with online tax preparation, TurboTax is the way to go. You’ll spend less effort preparing your taxes than with TaxCut, and the integrated Live Community help lets you find answers to questions about taxes or the software very quickly. If your return is simple and you don’t have a state return to file, the free online version of TurboTax or TaxCut might be sufficient for your needs. But for more complicated returns, or if you have a state return, you’ll get more bang for the buck with the desktop software version of TurboTax. It has features not found in the online version that make it a more flexible solution. It’s also faster. And if you’re filling a state return, the cost of the desktop version is the same.